Spring is always a harbinger of new things and it's the perfect time for companies to roll out new product lines. 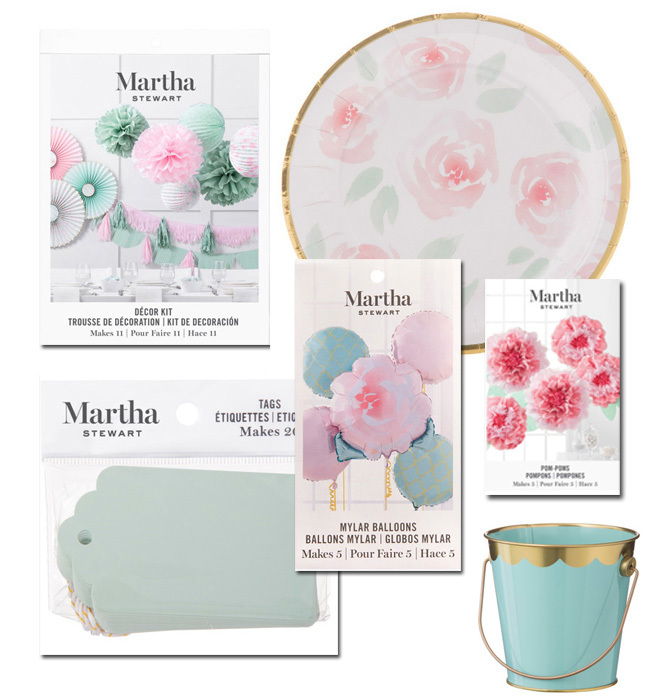 Martha's ongoing partnership with Michael's craft stores recently saw the unveiling of an extensive new collection of party supplies called "Celebrations" - just in time for one of the busiest celebration seasons of the year: weddings, graduations, birthdays, anniversaries, Mother's Day, Father's Day, not to mention family reunions and picnics. The Celebrations line is sub-divided into colour-coordinated themes, beautifully harmonized to decorate a setting with a cohesive look; there's Black & White, Blue Ombre, Pink Ombre, Copper, Gold, Indigo, Iridescent, Sterling, Meyer Lemon and Mint & Blush. 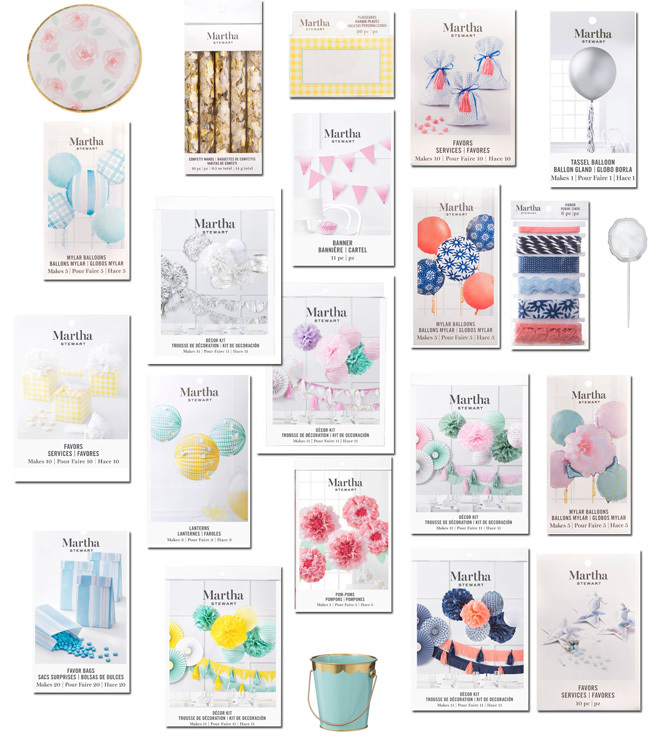 Within each colour category there are consistent offerings, such as paper napkins, paper plates, Mylar balloon bouquets, place cards, gift tags, gift bags, confetti wands, streamers, swags, pom-poms, ribbons and complete decorating kits containing all the essentials. Click here to have a look at all of the collections and some of the new products. Below are a few items from some of my favourite collections from the "Celebrations" line, available online at Michaels.com and at Michael's stores. 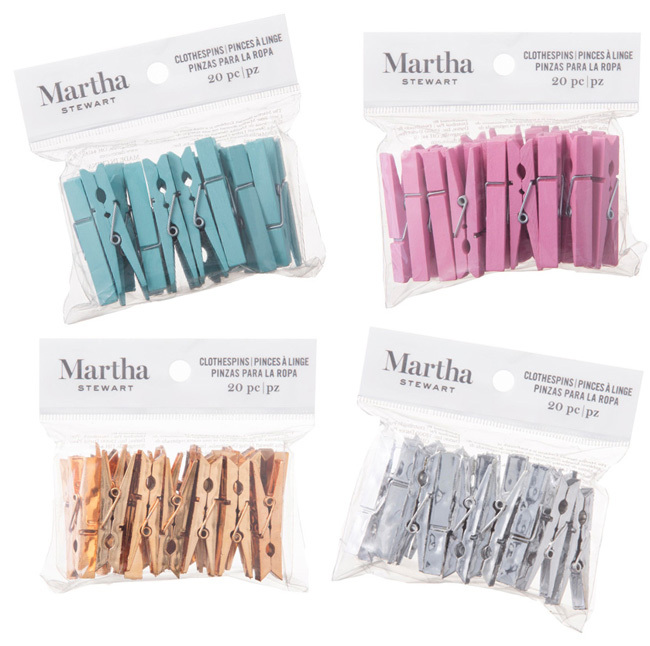 I just love all the colours of clothespins that are available in the "Celebrations" line. 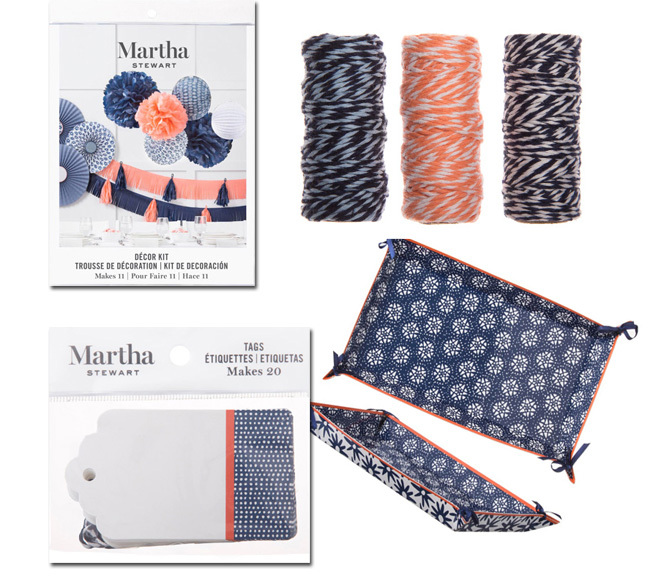 Shown above, clockwise from the top, are clothespins from the Blue Ombre, Pink Ombre, Copper and Sterling collections. You could use them to attach mementos and photographs to a swag for a wedding shower or anniversary party. The Indigo collection has a gorgeous colour scheme. I love the deep indigo with the crisp white and that pop of peach; it's masculine but not overtly so. In each collection, everything coordinates so beautifully. Martha and her team are geniuses when it comes to taking the guesswork out of party planning and choosing colour palettes. The Meyer Lemon collection, too, is just such a pretty palette to work with. 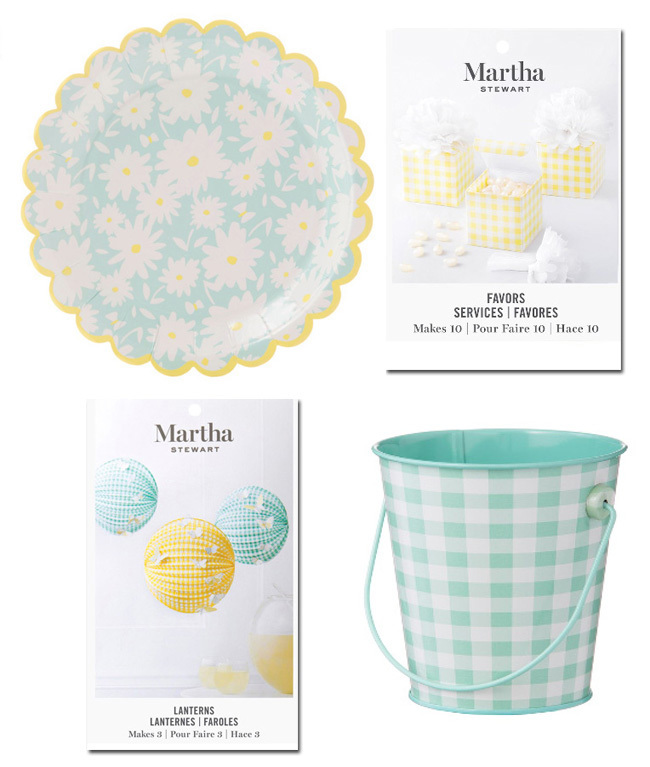 The paper plate, shown at the top, with its lovely scalloped edge and exuberant daisy design, is already sold out online! I can see why! Paper favour boxes in a pretty yellow gingham would look gorgeous filled with lemon candies or white jelly beans, or even dark brown chocolate-covered almonds. The small bucket, with its gingham design, is 4-inches in diameter and would be beautiful as a vessel to hold a bouquet of daffodils or used to give party favours to guests. I think the Mint & Blush collection is probably my favourite colour palette for spring. The décor kit has everything you need to decorate a small space. The paper plate, with its faded rose design and gold rim, would elevate any picnic. A package of five large pom-poms has the effect of giant peonies hanging from the ceiling. A 4-inch tinplate bucket with a gold rim and gold handle brings a hit of lacquer and sheen. The Mylar balloons come in a beautiful mix of shapes, shades and patterns and the simple, plain gift tags are the perfect shade of green. Thank you for posting about this, Andrew! Do you know if the line will be available at Michaels in Canada too? Yes, Becky, the merchandise is already on store shelves in Canada. I saw it just the other day at my local Michael's store!